Today is the first day of my four day trip to Connecticut. I am flying there so that I can attend my friend, Kristen’s, 40th birthday party. She doesn’t live there currently but it is where she grew up. Her mom is throwing her the party. I have known Kristen since 1995. She and I worked together at our first jobs out of college….making peanuts (not literally). Going on vacation away from the kids is always So bitter sweet. I am sad when I leave them, and they are sad when I leave. Faith had the hardest time separating this morning. After I leave them I feel guilty that I am going somewhere without them to have some fun. I then feel guilty because I am purposefully going somewhere to have fun without them. Then I wonder if I am being selfish and fear that something bad will happen while I am gone: either to me or to them. Arrgghhhhh! How am I supposed to relax and enjoy myself with all of that going on in my head?!? “Mommy Guilt” is a very real and powerful thing. So far, I am only at the airport. I won’t reach my destination until 5:00pm. Kristen is picking me up at the White Plains, NY airport and we will drive another hour from there. All guilt aside, I am enjoying myself. I have taken a nap, looked at some beautiful art in the Atlanta airport, and began reading a book that I hadn’t finished since my last vacation in February. So far, so good. The trip will get much more interesting In a few hours. I always say that you could put me in an airplane, fly around for a few hours, and then drop me back home and I would consider that a great vacation. :). 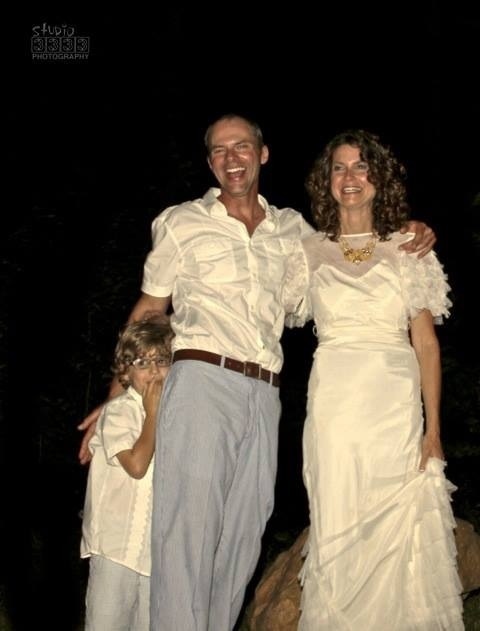 This entry was posted in Uncategorized and tagged Becca, Connecticut, kristen, vacation on June 28, 2013 by Becca. On Sunday Tom and faith drove up to Pennsylvania to see his mom. Rebecca, his mom, has been diagnosed with cancer. She is at home and being cared for by her husband and and daughter. It is a lot for anyone to handle the “Dressler invasion”, but even more so now for Rebecca, Will and Shelly. We thought this would be great time for Tom, faith and Rebecca to get some quality time together. They had a great time. I asked Faith, “How was MaMaw’s?” She replied,”Awesome!” They obviously had fun. 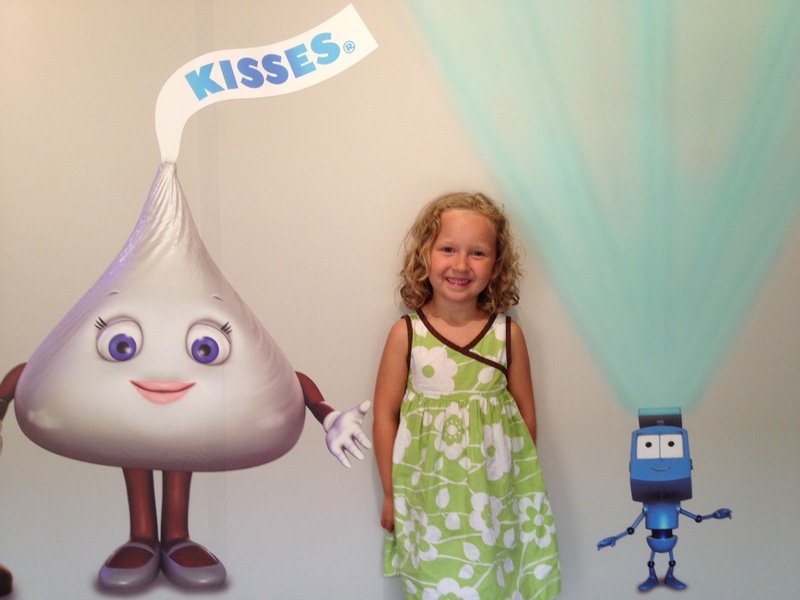 Faith got to go to Chocolate World in Hershey and make her own candy bar. All I know is that there was marshmallow in it. While Tom and faith were off having fun, I was at home having fun with wilson and miller. Let me state that I love faith and life would be miserable without her, but wow! I am amazed how much easier two kids are than three. I discovered out why this is so: two kids will do the same activity without problem, but with three, one always wants to do something else. Two want to play outside, one wants to go inside. Two want to eat, one wants to draw. Three is much more difficult to juggle. I always say that I could go to the moon with one kid! Needless to say, the boys and i had fun. We played games, we looked for bugs at the playground, they took a bath instead of going to the pool, and we just hung out. We went to the pool one afternoon with Doug and his family. It almost rained but thankfully it never thundered. 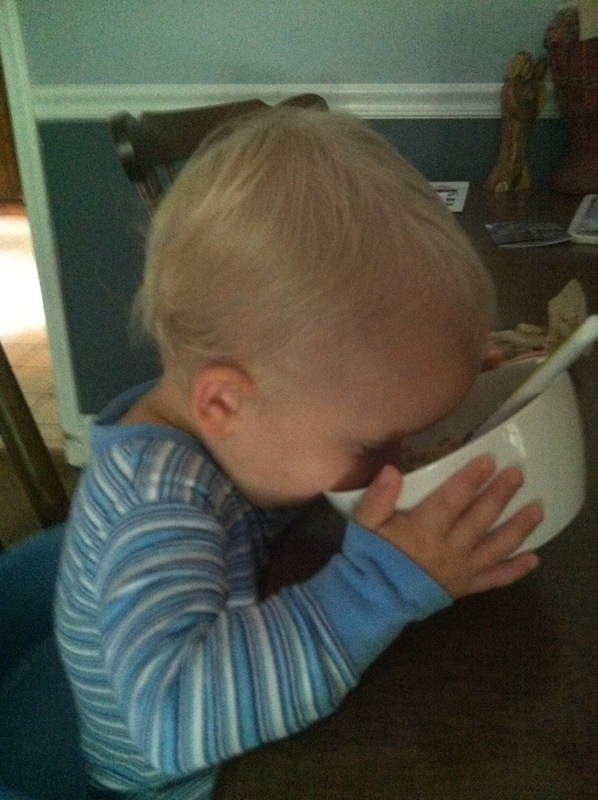 I also took them to get my car’s oil changed and taught Miller to drink milk out of his cereal bowl. Faith and Tom came home on Wednesday night. She has been glues to my side ever since. I even slept in her room with her a couple of nights. She wanted to have a slumber party. It was sweet to be missed so much. I missed her as well. This entry was posted in Uncategorized and tagged Boys, Miller, weekend, wilson on June 28, 2013 by Becca. Gretchen Slaughter Summerville is one of my oldest friends. We met during our freshman year at NC State in 1992. We were roommates for three years after that. Over the years we have grown and changed, and amazingly, we have gone in somewhat the same direction. We both have come back to NC, we are obsessed with healthy food (she is way more knowledgable than I), and we have kids about the same age. 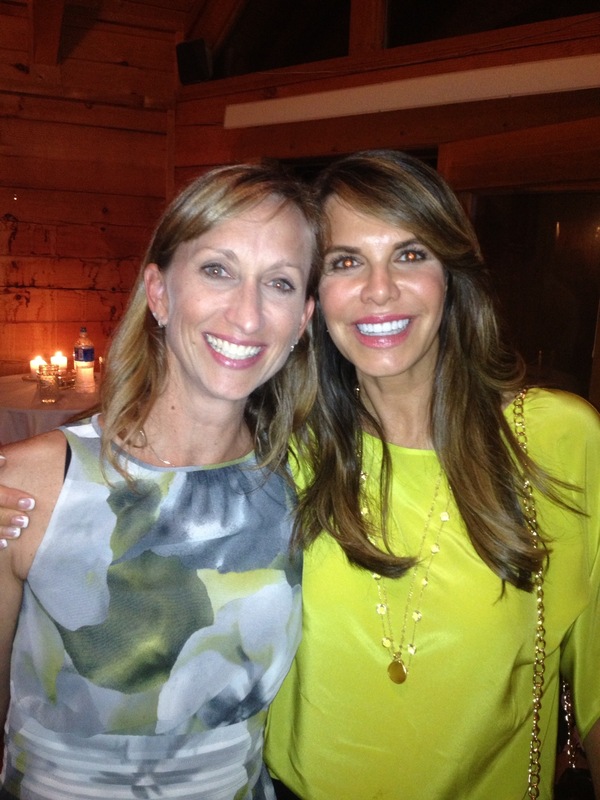 It is amazing how similar we still are….and how well I know my Gretchen. Gretchen got engaged around Christmas time to Josh. A few months later they sent out an invitation to their “Dessert Reception to celebrate their engagement.” My first thought was, “who has an engagement party six months after they got engaged?” Time went on, I had the party on my calendar, and waited. As time approached I thought, “I bet they are getting married either at the party or right before. There is no way that this is just an engagement party.” I still just waited to find out. Tom and I were able to go to the party together, and Doug tagged along. He has known Gretchen since he was in high school. I was all set in my city girl, cocktail attire on until it was mentioned that this was a “Boone, NC cocktail party”. Different standards exist in the mountains. Everyone had on an array of attire: from a Tommy Bahama shirt and shorts to a cocktail dress with heels. Luckily, I brought an extra pair of comfortable shoes, just in case. I had a great time at the party. Tom and I laughed more than we had in a while. We talked to people we had never met and some of Gretchen’s family that I hadn’t seen in a while. I really enjoyed seeing “Cousin Molly”. I even call her “Cousin Molly” instead of just “Molly”. Tom thought that was hilarious. Molly is great. She is so fun and genuine. She just had her first baby at the age of 47. I give her props for having one so late in life. She looked amazing, by the way. Finally, around 9:30pm, Gretchen and Josh announced that they were going to be getting married down by the campfire. I knew it! We all walked down to the campfire, lit candles and waited for them to come down. They did. They had said their own vows to each other in a very heartfelt manner (as they should). They seemed very in love and committed to each other. The service was short, but effective. They were married while surrounded by their family and friends. It was a fun filled evening for everyone. Tom, Doug and I got to go back to Gretchen and Josh’s house to sleep for the night. We had a wonderful evening out and were able to share in Gretchen and Josh’s special evening. This entry was posted in Uncategorized on June 26, 2013 by Becca. I have a pretty good life. Tom makes enough money for us to live comfortably. I have three well behaved children that love each other. I have great neighbors and friends. Tom gives me nights out when I want them. I even have two days a week to relax, or do chores, without the kids around. So, what is it that makes me feel stressed? I have got to learn to put the past behind me and move into the future while trusting God with all of the major life changes that are coming our way this year: Faith is going into kindergarten. Wilson will be starting preschool. I want to go to India for two weeks. Tom will have decisions to make in his work. People will get sick. I have to smile and know that it is all taken care of. I have to do my part and be responsible, follow God’s leading, and pray earnestly about the major decisions that will need to be made. But in the meantime, I need to relax and enjoy the peace that has been offered to me. I need to relax and smile, and enjoy the precious moments that I have with my three young, energetic children. The dishes can wait! I need to remember that God is faithful. I can’t add a single hour to my life by worrying or being stressed. This is just life, and my life is pretty darn good! This entry was posted in Uncategorized on June 24, 2013 by Becca. Rachel called me this morning and said that her son, Peyton, was crying because he wanted to go to the pool with Faith and Wilson. Could we come over? Of course we could! We love the Bishop family. Rachel is one of my best friends and Peyton is definitely Wilson’s best friend. We haven’t seen much of them lately for many reasons. Unfortunately, we should have been glued to their side since they are moving to India in a few weeks. We will be very sad when that happens. Today, however, we had a great time seeing them for most of the day. 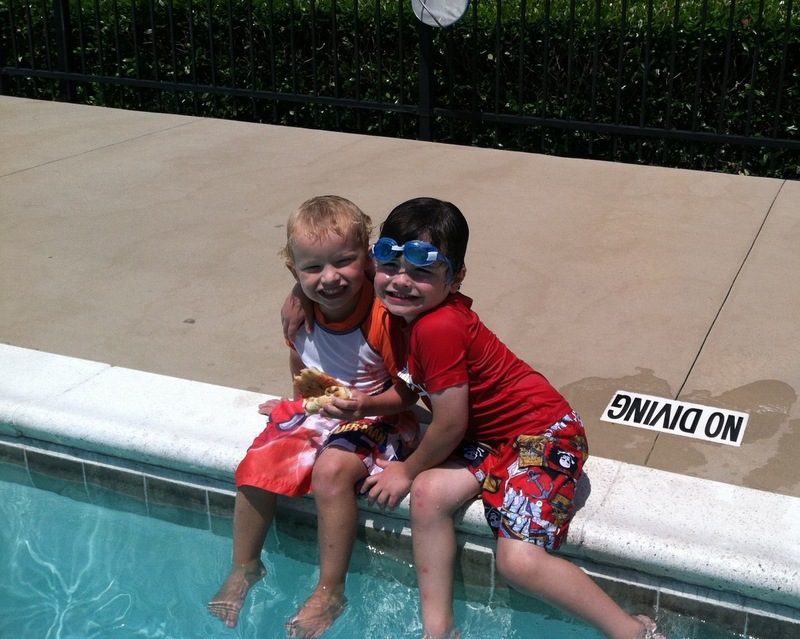 We played in their apartment, on the playground, ate pizza for lunch and then headed down to the pool to swim. Tom was even able to join us for the first half of the day. It was great to have him there with us. This entry was posted in Uncategorized on June 22, 2013 by Becca. We have so many great friends here in Charlotte and most of them have kids that are the same age as ours. That makes it even more special. 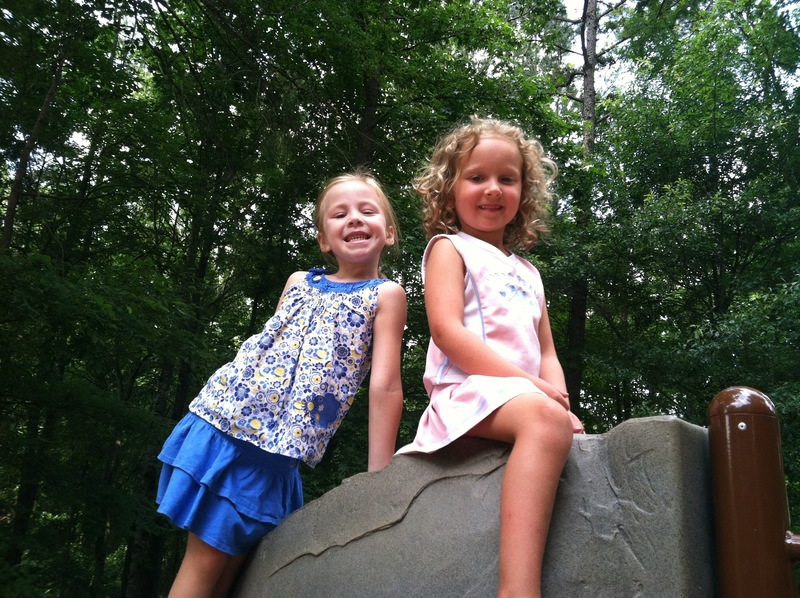 Yesterday we went to Sardis park to meet up with the Berkes, the TenBroecks and the Youngs. Emily Berke is one of Faith’s best friends and they hadn’t been able to see each other in a while. They were both so excited to see each other again. Sardis Park is about two miles from our house. It is where Faith had her birthday party when she turned two and four. Park birthday parties are the best! I didn’t have to clean my house or come up with games for the kids to play. The best part is that they are free! I would have every birthday party at the park if the kids would let me. Anyway, The kids had a great time. They got to play with their friends and I got to play with mine. I love Vicki, Julia and Sidney. I have been friends with them for years. I have actually known Sidney all of my life. Her parents and my parents are best friends. Sidney just moved into town from Asheville, NC. She is such a dear friend and I am very excited to have her living just down the road. Her two kids are the same age as my older two and they play wonderfully together. I love it! Charlotte may not have much to offer in terms of scenery or extreme outdoor activity, but it does have nice parks, lots of trees and wonderful friends and family nearby. As a stay-at-home mom, I have to have lots of friends to chat with during the week. 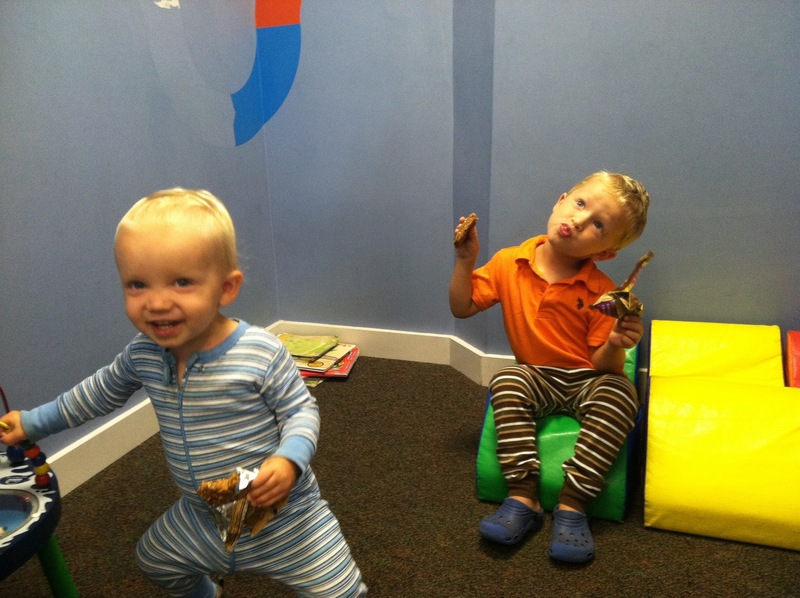 It is crucial to my sanity to have playdates with other moms and their kids. Faith and Wilson need that interaction too. It is a win-win for everyone. We had a great time with all of our friends yesterday. The kids walked through the woods, played in the tee-pee made of giant logs, and played for hours on the playground equipment. 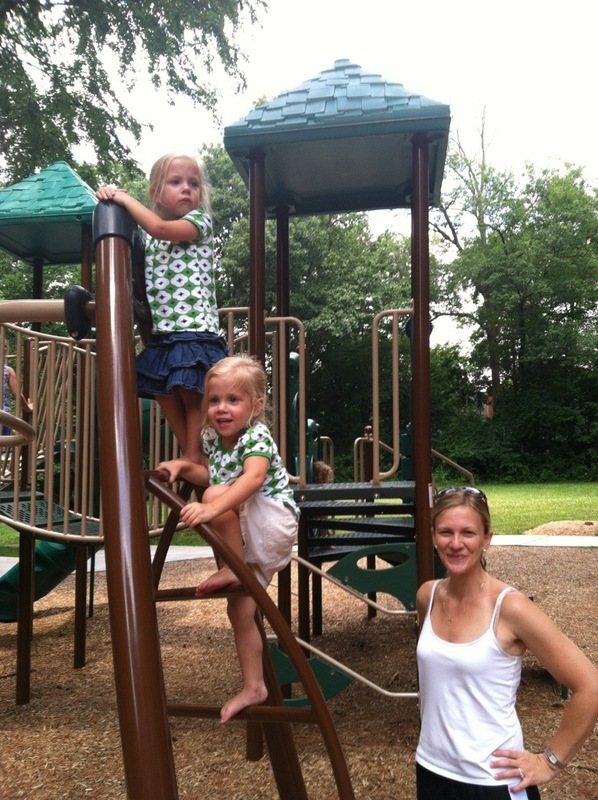 We were at the playground for almost three hours….which is quite a lot of time. It was a beautiful day with beautiful friends. 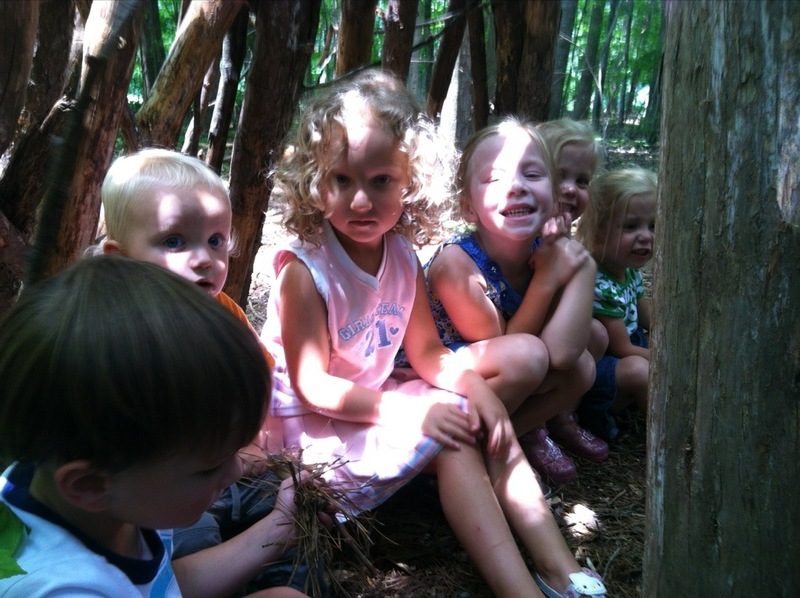 Some of the kids in the tee-pee . I wish I had gotten one with all of the kids. Maybe next time. This entry was posted in Uncategorized and tagged berke, sidney, tenbroeck on June 21, 2013 by Becca. I know that each child is different. 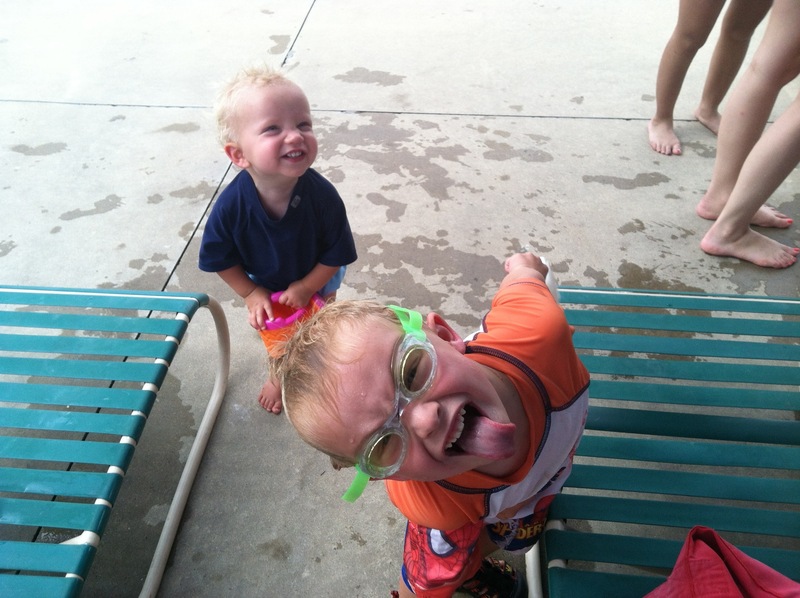 They each have a different sense of humor, different likes and dislikes, and different interests. As a parent, I can see that in each of my kids. Applying that knowledge, however, is sometimes difficult. Over the last month I have really had to look at Wilson and determine what is best for HIM as an individual. I have come to realize that he needs structure and he needs to be involved in organized activities. Because he is the middle child, I have kind of let him slip through the cracks (in terms of teaching him specific facts and working with him in other areas). It was suggested by a friend of ours that we look into putting Wilson in karate classes. Karate teaches discipline and patience, as well as letting the kids kick, hit and punch. Perfect! I called Taekwondo America, which is down the street and run by the father of one of Faith’s former classmates. He said that he never lets any child under 4 into his classes, but he would let Wilson come to one class, try it out and see how he does. Wilson rocked it! He followed all of the directions, sat quietly, and did everything asked of him. He also enjoyed it. 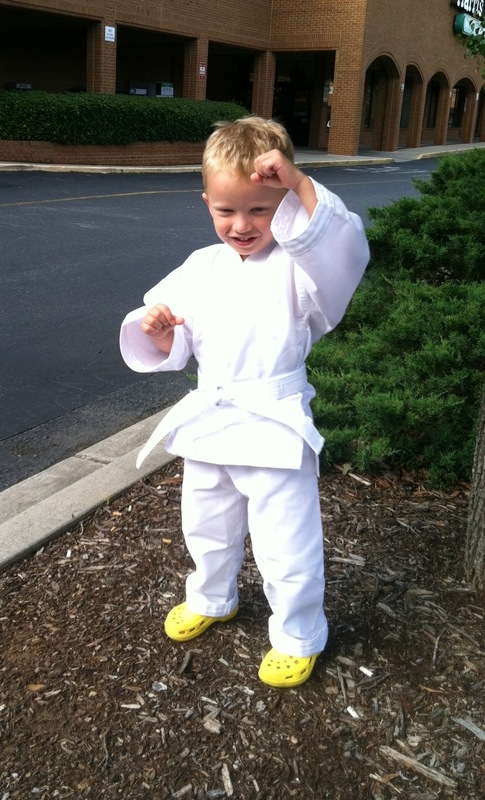 He is now going to Taekwondo three days a week for thirty minutes. On the other two afternoons he is going to “sports camp” at the YMCA. It is a forty five minute class that teaches the kids tee-ball, soccer, flag football, and another sport. He loves that as well. Today, I signed Wilson up for preschool for next year. I had a hard time deciding where to send him and for how many days. I only sent Faith to school one year and for only two days per week. This is when I have to realize that Wilson is different and act accordingly. I think that Wilson will thrive in school. I have failed to teach him a whole lot here at home and I know that he needs to continue learning and filling up that little brain of his. I finally decided to send him to Cross and Crown (where Faith went) for three days a week. I know most of the teachers, I know the Head Master, and I feel comfortable sending him there. I almost cried as I walked out of the church today after signing him up. I realized that my little boy is growing up and that I have to let him leave me a little bit. I love my free time, but knowing that he will be gone three mornings a week makes me a little sad. Of course I immediately began to question my decision…”did I do the right thing?” “Are three days too much?” “Will he feel like I am sending him off and don’t want him at home?” All of these thoughts flood my brain instantly. I have to remember that no decision is final. I also have to remember that each of my children are different. Wilson will thrive in school and I think that he will love going. Wilson is a very busy boy right now. I don’t want to bog my kids down with activities, but for the summer, I think it is the best thing for Wilson, and for the rest of us. 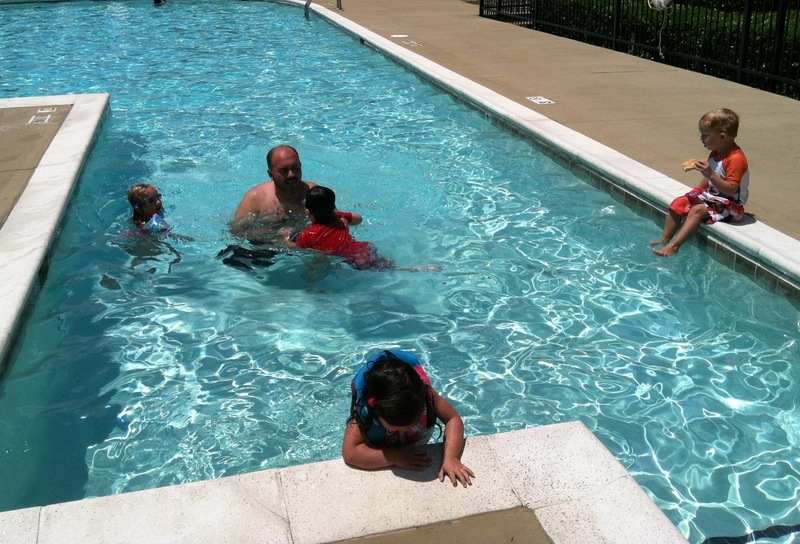 This entry was posted in Uncategorized and tagged cross and crown, school, sports, wilson, ymca on June 19, 2013 by Becca.